In this market it is usually observed that the deal often comes down to negotiations between the realters of both the parties. I would like you to know that if such a situation arrives you can trust on me. I have cracked many deals in my professional career and I can do this for you too. To give you an idea about how much my clients are satisfied with my work I would like you to read comments of my few clients. To find your dream house this is the best time to search and I am here to help you at every step. In the market [name of the area] during the negotiations about the deal, it often comes to the point that the agents from both the sides have to negotiate on behalf of the clients. The professional ability of an agent in true meaning is tested in such a situation. I have cracked many deals earlier in my career and I would like you to put your trust in me. To help you in building this trust I would like you to read some comments written by my previous clients regarding my work. [name of the agent] came like an angel into my life. I was in a desperate need of a house as I had to move out of my previous house. Among all the other issues I was facing, I was unable to pay a huge amount of rent, yet I needed a house with enough space so that my family could live in comfort. All this was made possible by [name of the agent]. He used his professional skills to found us a comfy house and that too at a reasonable price”. – [name of the person]. I would like to thank [name of the agent] for his efforts in finding me a new home. I can say with surety that I made no mistake by putting my trust in him. I would like to recommend [name of the agent] to everyone who wants to buy a new home but does not want to spend a huge amount”. – [name of the person]. It was nice talking to you in the meeting on [date]. 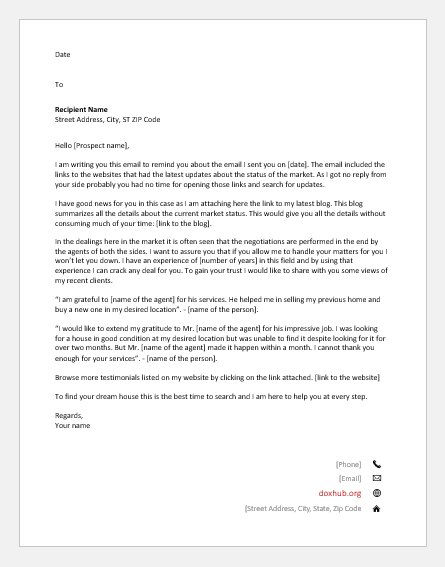 I had sent you the links about the current market status in my previous email as per your demand. But unfortunately, I got no reply from your side, so I am assuming that you couldn’t find enough time to open all those links and search for the current market status. If this is the case, then I would like you to know that there is nothing to worry about. Here I am sharing the link of my blog with you. This blog is dedicated to summarizing the current market status so that you can have all the information in very less time. [link to the blog]. It is usually seen that in this market the dealing often comes to a point that the agents of both the parties have to sit and negotiate. It is the true test of one’s professional ability. I would like to assure you that if you choose me for handling such matters for you, I by using my previous experience of [number of years] can crack any deal for you. In order to gain your trust, I would like to share the experiences of my past clients with you. “I came to know about [name of the client] by reading an ad in the newspaper. 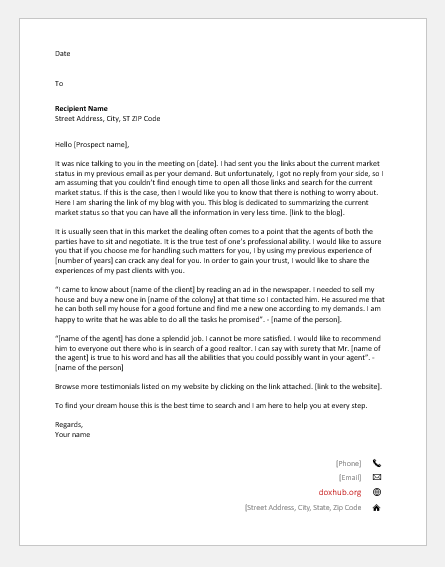 I needed to sell my house and buy a new one in [name of the colony] at that time so I contacted him. He assured me that he can both sell my house for a good fortune and find me a new one according to my demands. I am happy to write that he was able to do all the tasks he promised”. – [name of the person]. Browse more testimonials listed on my website by clicking on the link attached. [link to the website]. 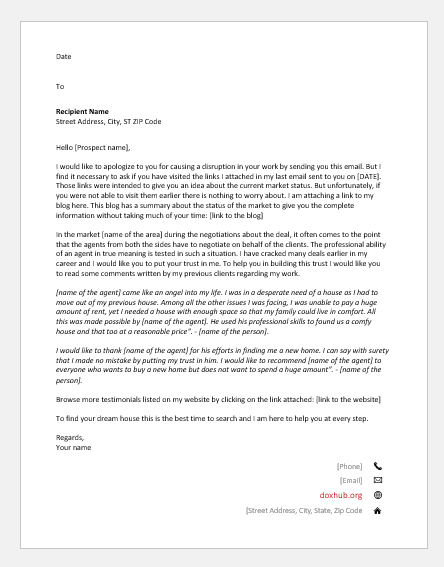 I am writing you this email to remind you about the email I sent you on [date]. The email included the links to the websites that had the latest updates about the status of the market. As I got no reply from your side probably you had no time for opening those links and search for updates. I have good news for you in this case as I am attaching here the link to my latest blog. This blog summarizes all the details about the current market status. This would give you all the details without consuming much of your time: [link to the blog]. In the dealings here in the market it is often seen that the negotiations are performed in the end by the agents of both the sides. I want to assure you that if you allow me to handle your matters for you I won’t let you down. I have an experience of [number of years] in this field and by using that experience I can crack any deal for you. To gain your trust I would like to share with you some views of my recent clients. “I am grateful to [name of the agent] for his services. 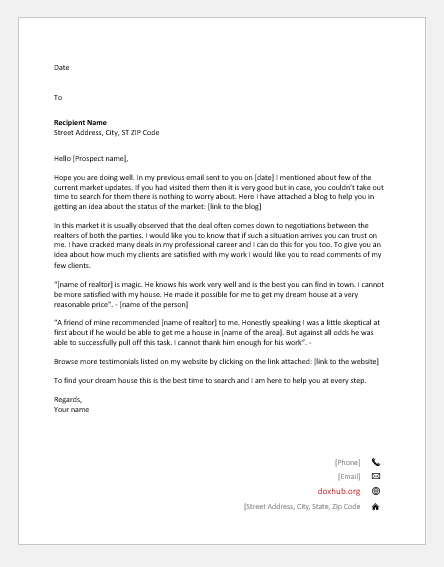 He helped me in selling my previous home and buy a new one in my desired location”. – [name of the person]. “I would like to extend my gratitude to Mr. [name of the agent] for his impressive job. I was looking for a house in good condition at my desired location but was unable to find it despite looking for it for over two months. But Mr. [name of the agent] made it happen within a month. I cannot thank you enough for your services”. – [name of the person].